In your country, is the biggest city the only thing worth seeing? No, of course not, and the Czech Republic is no different. Prague is a wonderful city, but it’s far from the only place worth visiting. There are at least a dozen smaller towns that are just as beautiful as Prague and they’re less crowded and better value for money into the bargain. Český Krumlov is probably the best known town for its dramatic setting in a loop of the Vltava river and the colourful chateau tower that soars above the historic centre. Karlovy Vary is sometimes better known as Carlsbad and was world famous during its heyday as a spa resort for the leisured classes of 19th century Europe. 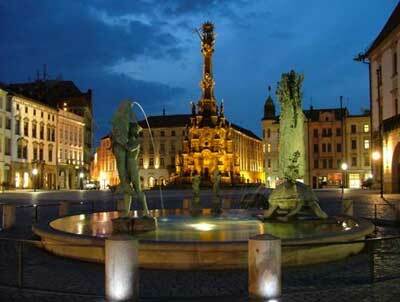 Olomouc is the old capital of Moravia and has the largest historic preservation zone outside Prague. It’s a thriving university and cultural centre and also an excellent base for exploring the nearby castles and Moravian countryside. Kutná Hora is popular for its quirky bone chapel and elegant cathedral spires and the colourful old town of Telč is surrounded by tranquil lakes and has probably the prettiest main square in the country. Why go outside of Prague ? Foreign travel is not just about rushing around ticking sights off a list every waking minute of every day. Many travellers’ favourite memories come from tasting specialty regional foods and drinks, people-watching or simply strolling around the streets and squares and seeing what hidden corners you uncover. Smaller cities and towns are perfect for this. There are smaller crowds, less traffic and more things will be within walking distance. (Prague’s transport system is one of Europe’s least expensive and easiest to use, but it’s still not as nice as walking). Won't it be difficult to communicate? If you’re concerned that you won’t be able to communicate once you get out of the big city, don’t be. If anything you’ll probably find it easier. Think about your home country and its biggest city again. There are plenty of people there who don’t speak foreign languages aren’t there? And probably some who wouldn’t help a stranger even if they could. Wherever you go, once you have your phrasebook, the main things you need from people are a little patience and a willingness to try to understand you. And, just like in your country, you’re more likely to find people like that once you get away from the hustle and bustle of the biggest cities. It’s no secret that smaller towns offer better value for money than big cities, especially if you want to be in a good location. Private accommodation for two overlooking the main square of Telč starts at around 800Kč. In Prague you’d be lucky to catch a glimpse of the old town square for five times that amount. On the main square of Český Krumlov or Olomouc a large glass of cold beer or a coffee will set you back around 25Kč. On the square in Prague, you’ll pay 90Kč. Even if money were no object, you might still prefer the smaller cities and towns for their friendlier, more individual service, especially if you seek out (or follow our directions to) independent locally-run places. You’re not travelling all this way for chain restaurants, hotels and coffee lounges now, are you? Most international tourists visit the Czech lands for its manmade attributes; the architecture, cityscapes, history, culture and cuisine (notably the liquids). There are also some surprisingly beautiful natural areas. Cave systems, national parks and bizarre rock formations are the highlights, but the gentle countryside is crisscrossed with walking trails and is perfect for cycling, especially along the river valleys and through the vineyards of South Moravia. You could easily spend a month travelling the Czech Republic and doing something new and interesting every day. Destinations outside Prague don't have famous and impressive names that will dazzle your friends at home, but a decade from now people will be saying “I wish I could’ve seen these places ten years ago”. So what are you waiting for? Click away and explore the historic lands of Bohemia and Moravia on OutsidePrague.com. Happy travels.